Create a casual look in your living space with this three cushion sofa. Flared arms and the split back design offer simple details to the piece. The thick seat cushions offer plenty of comfort to relax and unwind during your evenings at home. 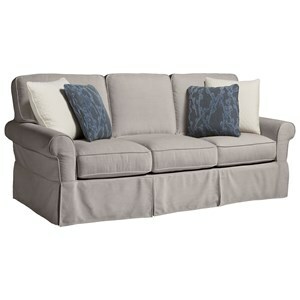 The Becklow Casual Sofa with Flared Arms by Palliser at Reeds Furniture in the Los Angeles, Thousand Oaks, Simi Valley, Agoura Hills, Woodland Hills, California area. Product availability may vary. Contact us for the most current availability on this product.